It was a bit of a “Mystery Tour” finding the way to DJ Wines at Monk Soham, but the Capel Ladies Club party were an intrepid group and didn’t give up until they found the exact location in a one-time piggery in the heart of Suffolk. This is where Derek Jones produces hand-made fruit wines, fruit liqueurs and mead, using mainly locally sourced fruit such as raspberries, strawberries, rhubarb, gooseberries, elderflowers and honey. Derek has been running his wine business for over five years. He used to be a cheesemaker and has also worked at Otley College. His change of career obviously paid off, as his business now sells his wine to the Co-op and also exhibits at fairs and shows. He uses slow, natural methods to make his wines, adding only minimum amounts of sugar, plus yeast, so they taste “full of fruit and deliciously natural” according to him. But the proof of the pudding is in the eating, as they say – and so Capel Ladies were given the chance to try several different wines along with artisan breads from Framlingham, cheeses from “Suffolk Cheeses” plus salamis and rapeseed oil dip. The three drivers in the party were given elderflower cordial but the rest of the party enjoyed sampling the wines and also mead made from Suffolk heather honey. A nice way to spend a sunny afternoon in May! 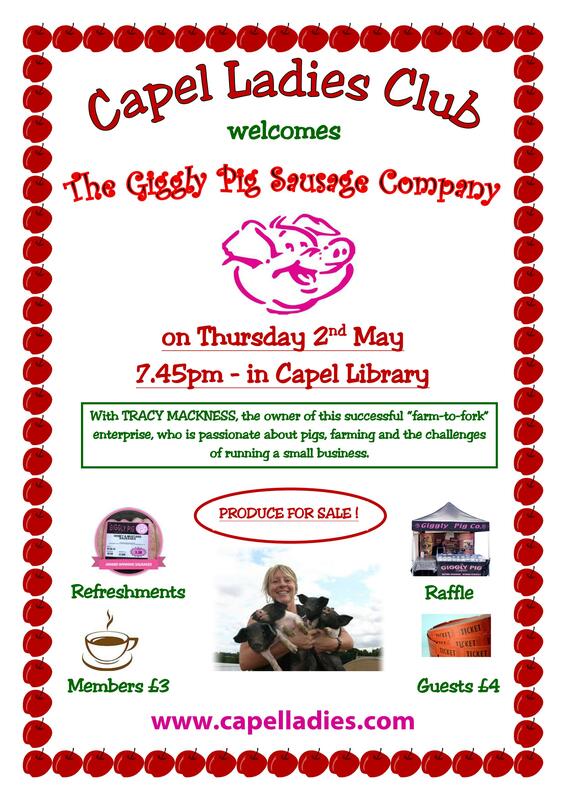 Our May meeting was not an evening for Weight-Watchers or Slimming World Members! Sarah Knights from Chappel Chocolate House, near Colchester, was on hand to give us a demonstration of the chocolate-making method, and to let us sample and buy her wares! Assisted by her friend Julia, Sarah talked us through the process of “tempering” the chocolate by adding cool chocolate button drops to a bowl of melted chocolate at a temperature of 60 degrees Celsius and stirring constantly until all the buttons melted. Once the chocolate has been tempered it sets easily in moulds, has a sheen to it and snaps crisply when broken. These are the signs of good chocolate – not forgetting the taste, of course! The skills needed for a qualified chocolatier are similar to those of a chemist, and a chocolate-maker must have technical skills and a grasp of the science behind the art of chocolate-making! Lots of goodies to buy! Sarah Knights has an engineering background and she once worked for the M.O.D. as well as in the telecoms industry. Having gone to a patisserie evening class as part of a leisure pursuit she found she had chocolate-making skills and set up a small business 3 or 4 years ago doing Birthday Parties and Easter Eggs as well as selling her chocolates at local Farmers’ Markets. She has attended a number of courses in the art of chocolate-making and her business has grown over the years since then. Birthday Girl Dorothy gets to scrape the bowl! Qualities needed to produce a good bar of chocolate depend on where it is grown and on the fermentation and roasting processes which can create different flavours, and the vital ingredient of cocoa butter. On display was a wide range of chocolate bars, plus small filled chocolates in every flavour you could wish for! We sampled various types of chocolate, from plain (with up to 80% of cocoa beans and 5% sugar), to milk chocolate (with 30% cocoa beans plus milk and up to 33 ⅓% sugar), and also white chocolate (containing no cocoa beans and 54% sugar, plus milk solids and cocoa butter). We could then decide on which we preferred and make our purchases. The only problem was deciding which ones to buy! A very interesting and enjoyable evening was had by all!